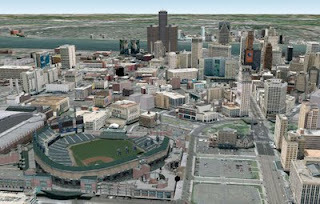 A few of us on the SketchUp team either have roots in Detroit or grew up there, so we're especially happy to announce that Detroit, Michigan as been added in 3D to Google Earth. From sports venues like Joe Louis Arena (home of the Red Wings) and Comerica Park(new home of the Tigers), to great watering holes and eateries, like the The Old Shillelagh and the legendary Lafayette Coney Island - home of the world's best 2am coney dog - they are all there in 3D. I like it. I would gladly have visited this city. I am happy that I can see them in 3D. I love this town... lots to do and see, and the history is really neat. The only place to go for Coneys in the city.